Print your logo onto these custom printed everest scarves or one of our other innovative scarves and use them in your next marketing campaign as a unique giveaway item. The Everest Scarf is a stylish scarf with tassles which are cable knitted from acrylic yarn. Keep your clients or staff warm with this staple embroidered scarf. Colours: Stone, Grey, Navy, Black. Branding Options: Embroidery 100mm circle. The min quantity is 25, please add $1.50 to the unit (min) price for this amount. Custom brand these cooling scarves or one of our best-selling promotional clothing»scarves with your company logo! We can embroider the promotional everest scarves with your company logo. The exact cost of the embroidery will depend on how large the embroidered area of your logo is. Sometimes logos are too detailed to enable us to effectively embroider them onto the everest scarves, as the stitching will simplify your logo so that any fine detail will be lost or can simply not be achieved. Personalise your everest scarves or custom design scarves for your marketing campaign. How can these unique promotional everest scarves or our personalised scarves fit in with your marketing strategy and help you maximise your brand exposure? Our custom made Everest Scarves can be produced from a minimum quantity of 50 pieces. 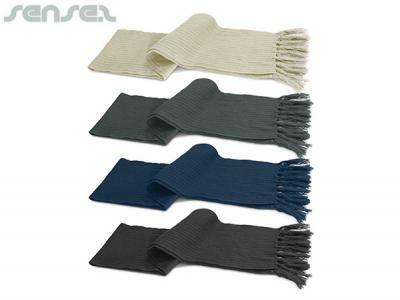 We can have your logo branded on these corporate Everest Scarves in Embroidered. A setup fee of AU$180.00 will apply to make the film.